Suzhou has over 2,500 years of history contributing to its success as a major economic hub and center for trade and commerce. An integral element of Suzhou’s prosperity was The Grand Canal – a vital trade route bringing people together and fostering a culture of collaboration. Although the canal no longer serves a commercial function, modern modes of transportation including high-speed railways, subways and trains converge on the city continue promote growth within Suzhou New District. 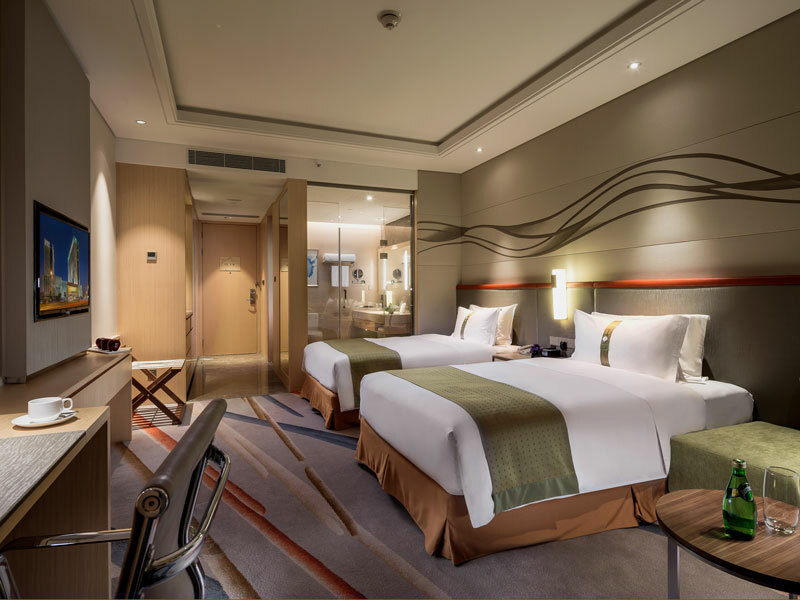 Embracing the rich and varied past of the city was a major inspiration for the Suzhou HuiRong Holiday Inn Hotel and the design of this 33,000m2 property flows from one strength to the next. SL+A’s conceptual design message truly combines Suzhou’s past and present by adapting intricate architectural features to symbolize the evolution of transportation in the area. In Suzhou, this hotel stands out amidst the hustle and bustle and it is the perfect place for both business and leisure. As guests enter the hotel, they are greeted with high ceilings, a pleasing palette of buoyant colors, and a marble floor pattern denoting the gentle ebb and flow of a stream. 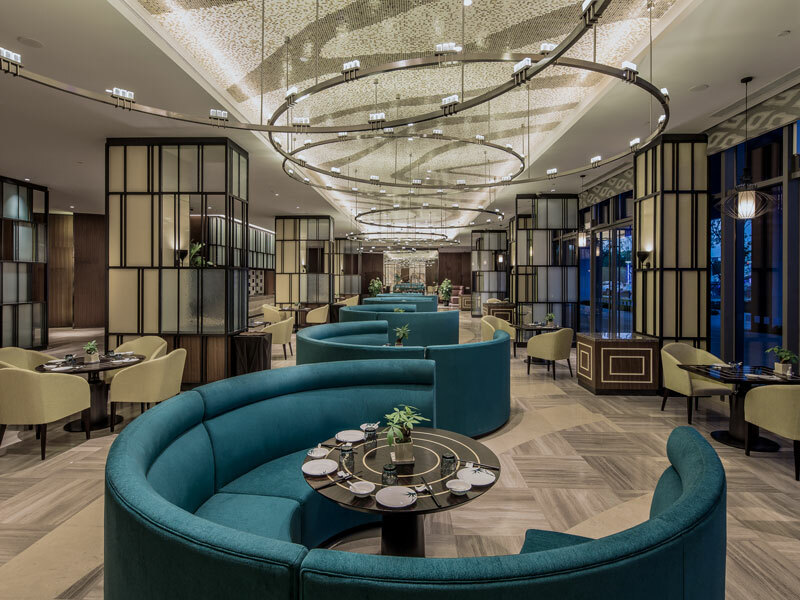 Light emanates from the chandeliers overhead and the champagne colored vertical wood-rail walls accented with brushed stainless steel represent Suzhou’s many canals. With over 250 guest rooms stocked with amenities and furnished using contemporary bespoke graphic designs and full headboard walls, guests can truly feel the comforts of home. 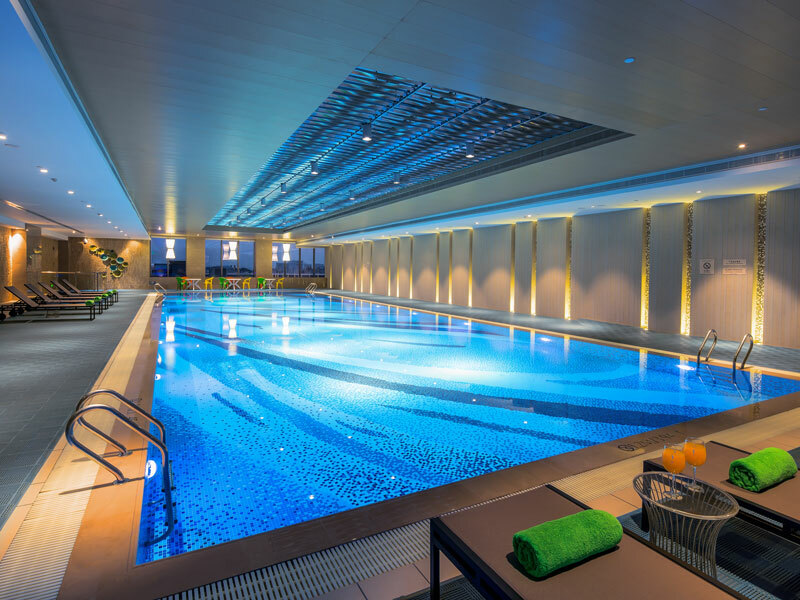 Suzhou HuiRong Holiday Inn also boasts multi-use facilities, an indoor swimming pool and meeting spaces. The 1,200m2 ballroom is amongst the largest across all hotels of the Holiday Inn Group. This multi-functional ballroom can comfortably seat up to 800 people underneath a breathtaking custom light fixture specially designed by SL+A that accentuates the grandeur of the space. An earth-toned color palette found throughout the building works in harmony with the interior design concept and creates a sense of relaxation and connectedness. The all-day dining area features show-stopping three dimensional wood panels that draw the eye up to the intricately sculpted ceiling. Playful pops of citrus colors in the seating areas coordinate with soft earth-toned fabrics. In addition, the Chinese restaurant spans two floors: the first houses a modern and chic open-plan dining area with artistic glass etchings of canal topography as partitions. The second level is dedicated to private dining rooms that exude modern elegance paired with distinctive Chinese lattice screens, wallpaper prints and artwork. Special sculptures and paintings of Osmanthus, the official flower of Suzhou City, decorates window panes as the art feature in VIP dining rooms. 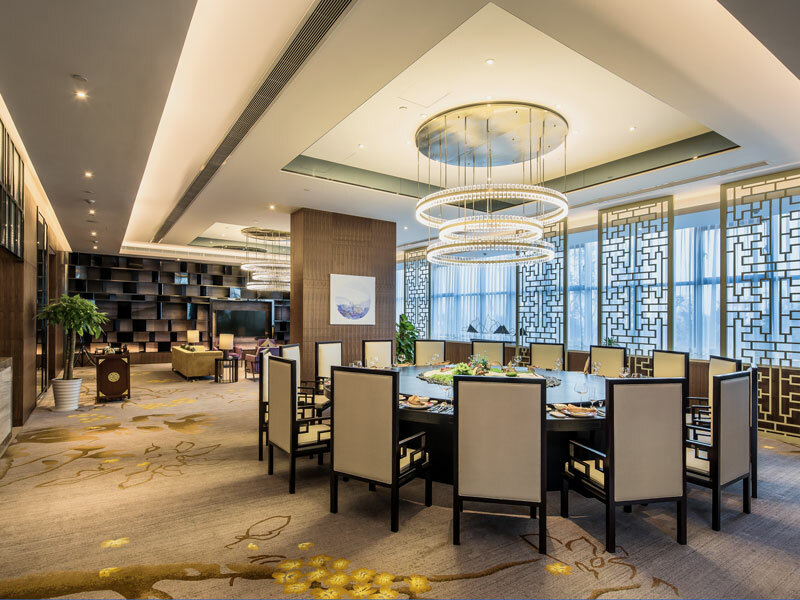 The main design concept of “Integration” throughout the interior design of Suzhou HuiRong Holiday Inn is represented by a selection of curated elements that create a sense of forward movement suitable for forging new business ventures. Spacious and elegant, there is a contemporary twist on each detail of this eight-story construction. It is clear that this hotspot is the perfect place for businesses from diverse industries to meet and build strong networks for the 21st century.